Every foodie has their favorite cooking shows. Those of us who grew up on Julia still tune in to watch her unassuming and brash way in the kitchen. 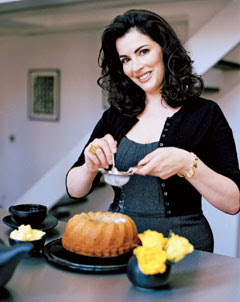 I have a massive platonic girl crush on Nigella Lawson , who can make tumbling blueberries into a bowl seem like a prelude to a kiss, and who always looks as if she has been recently laid. Well. 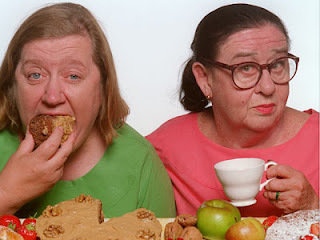 But I have equal love for the Two Fat Ladies , who never once made anything I would want to put in my mouth, but were a delight to watch. They are wonderful food entertainment, often incomprehensible, seemingly totally unaware that they are being filmed for television, and unapologetic about their vices. But nothing makes me happier than shows where food may not be the focus, but is a definite supporting character. I love Brenda’s sugar addiction on The Closer , watching her sneak a chocolate bar is as much fun as watching her get the confession. Whether it is Michael Weston’s yogurt obsession, or the passionate devotion to fruit of Damian Lewis' character Charlie Crews on the all-too-short-lived Life , or the huge family meals on Everybody Loves Raymond and Soul Food, watching characters engage with food is enormous fun. Lucky for me (#47 on the DAMN I’m lucky list, to be precise) my Charming Suitor is a foodie like me, so I can usually convince him to watch fun food shows with me. And our latest find is a gem from England called PIE IN THE SKY . 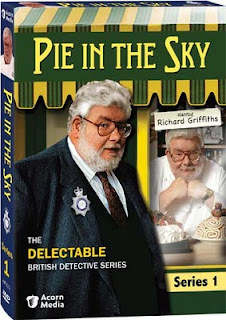 A five season tasting menu starring the subtle and delightful Richard Griffiths, the show follows Detective Inspector Henry Crabbe, a gourmand of epic proportions, as he tries to extricate himself from police work and solving mysteries so that he can devote himself to his role as the chef/owner of a small restaurant. 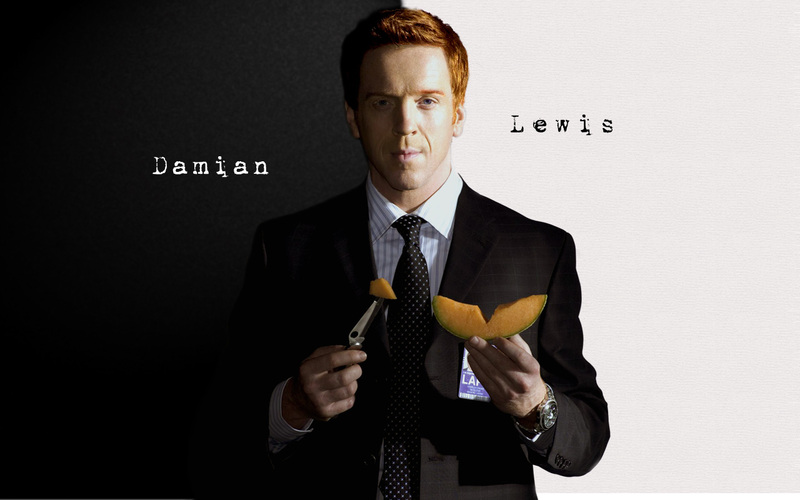 You heard me right, Chickens, your Polymath has actually found a show that is a POLICE PROCEDURAL WITH COOKING!!! Be still my heart. He finds the clues, and the escargots. He sniffs out the bad guys like a truffle pig. He plays the suspects against one another, and plays classical music for his chickens for the most delicious eggs. In the first episode his nemesis first serves him prosciutto and dry white wine before shooting him in the leg and stealing the sterling silver peppermill he keeps in his pocket. CS and I were hooked. I cannot recommend it enough. It is a delicious bit of fluff. So in honor of Henry Crabbe, and his restaurant Pie in the Sky, a summery pie recipe, perfect for the current and fleeting abundance of ripe and juicy nectarines and peaches. It is easy to assemble, quick to bake, and cool and creamy and refreshing to eat after a summer meal. Preheat the oven to 350 degrees. Put graham cracker crumbs in a bowl and pour in melted butter over, tossing lightly until moistened. Pat half of the crumb mixture over the bottom and up the sides of a deep 9- to 10- inch pie plate or springform pan. Cut the fruit in half and remove pits. Arrange pitted side up on the crust. Mix sour cream, sugar, eggs, vanilla and nutmeg in a bowl and whisk until smooth. Pour the filling over the fruit and sprinkle with the remaining crumb mixture. Bake 40 minutes, until puffed and set in center. Cool to room temperature, cover and refrigerate until chilled. Know what else is delicious? Lunch. With your best bud. And me and Jen Lancaster. Enter to win here. I'm going to look for Pie in the Sky, have never heard of it. Is it on PBS or strictly on DVD? Agree with all of your other favorites and am so glad they now have a new home on The Cooking Channel. RE: The Two Fat Ladies: this past Saturday TFLs featured a show showcasing crab, which I think you would have enjoyed. The Buttered Crab was a decadent delight of crab sauteed in butter, shallots, and garlic, placed back in the crab shells, topped with bread crumbs and lightly broiled. And the Mustard Green Beans looked yummy, even to this non-veggie eater. That show sounds great! I was so sad when Pushing Daisies went off the air. That was a great detective/food show, too. Thanks for taking the time to stop by our Food2 Stone Fruit party! Oh....Pushing Daisies. SO loved that show. 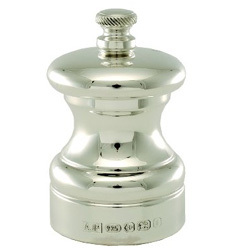 I think I'm going to start carrying a sterling peppermill in my pocket. It's going to be my totem so I know if I am dreaming or awake. Or perhaps I will carry Leonardo diCaprio in my purse. No, Johnny Depp. With a fondue stick. In the study. There are also now in England the two hairy bikers. A bit like two fat ladies. 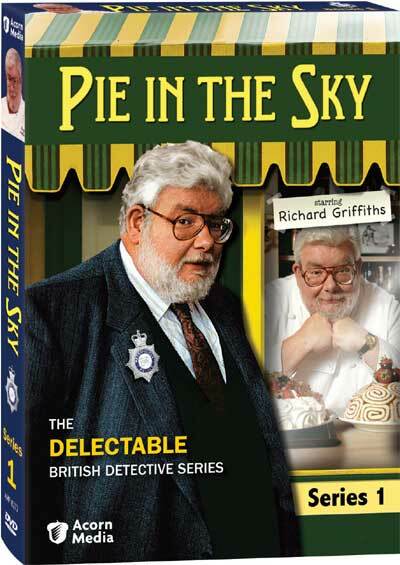 New to this blog and just read this morning that Richard Griffiths has passed away. Was curious about watching Pie in the Sky and now I read this on your blog! Now I must watch! Just read "Off the Menu" and I loved it! I work for a baking company and happened to receive a call from Naomi at TispyCake and mentioned that I read your book and it mentioned her in it. She was delighted to say the least!